Wednesday, May 25th sees the culmination of our hurling championship with 4 divisional finals taking place on the main pitch in McHale Park, Castlebar. Mountpleasant NS will take on Derrinabroc NS in the Division 4 final, followed by Behy NS Vs Balla NS in the Division 3 decider. At 5pm a cracking game is in store as Carracastle NS meet Aghamore NS once more following their drawn game in the Mini 7s competition earlier this year. 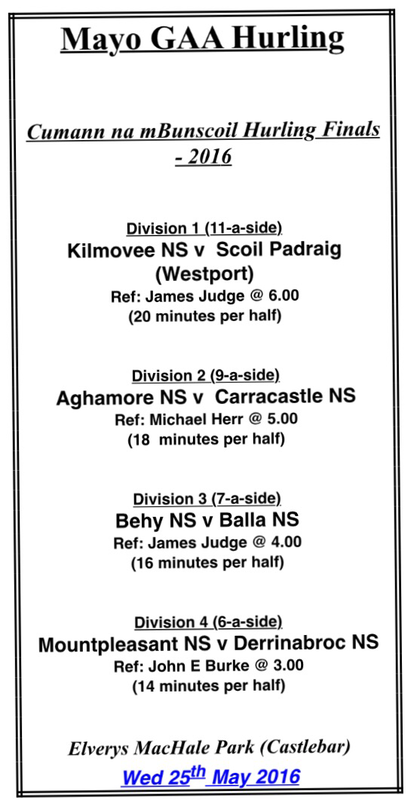 The evening will draw to a close with the egerly anticipated meeting of Kilmovee NS and Scoil Pádraig (Westport) in the Division 1 final. A great evening’s sport is in store at the home of Mayo GAA. Well done to all on reaching this stage and best of luck!